Considering getting into dirt bike riding? Here’s my beginner’s guide to dirt bikes to help you make the right decisions along the way. Maybe you’ve been riding road bikes for a number of years and are looking for something new. Maybe you’ve never ridden an adult size motorbike and remember those days as a kid riding that Honda 50 around the back garden. Trail riding can give you that freedom of riding where the only thing limiting what you can do on your bike is your own skill, not a set of road rules and restrictions enforced on you by police in the name of road safety. You can open the throttle or pull a wheelie without fear of losing your license. 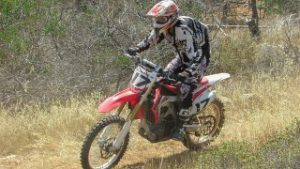 So you’re at that place where you want to go off-road riding on the weekends, here are some things you need to know. The first instinct is to rush out and buy a 450cc enduro weapon like a Yamaha WR450F or KTM 450EXC. It’s easy to be tempted into buying a bike that is way more than you need as a newbie. Consider the fact that a lot of very good experienced riders and racers ride a 250cc machine. These days a 250cc bike has a lot more power than 20 years ago. With the high performance 4 strokes around now, it is very rare that you will encounter terrain that a 250cc can’t handle. Sure, in situations like desert racing a bigger bike is an advantage, but as a new rider, you will certainly not be doing that. The advantage of a lighter weight bike will be far more valuable to you. Bikes are very tall these days, and if you are a little ‘vertically challenged’ you will be glad of a light bike every time you have to pick it up. The Yamaha TTR250 is a good example of the perfect bike to start on. No water cooling to worry about, lightweight and certainly looks the part. Find your local trail riding club and go along to an event and meet some likeminded people. There will be no shortage of advice and you’ll get to see what sort of bikes they’re riding. They may know someone who is selling a bike that is suitable for you. Most guys and girls start off with a second-hand bike. It’s not all about the bike. You will also find out where you can ride off road legally, and where you can’t. You will also meet some riding buddies as it’s not a good idea to go trail riding on your own for obvious safety reasons. The fun is with the group. Of all the gear you need, these are the two things you do not go cheap on. The helmet for obvious reasons – what price do you put on your head? The choice these days is fantastic. They all come with a removable inner liner which can be washed and refitted. The boots rate next because generally in any fall on a dirt bike, the feet are what cop the most impact. Whether it’s getting your boot jammed under your bike after you’ve dropped it, or hitting trail obstacles like exposed roots and rocks, you will be glad you invested in some good boots. If you buy a good quality helmet and boots first, it’s cheaper than having to buy them again later after the first ones weren’t up to the job. Falling off can be very painful, so good riding pants, body armor, back protector, knee and elbow pads (which may be integral with your jacket and pants) all help so that a fall does not end your day’s riding. Other essential equipment on your list should be a good Hydration Pack and Tool Kit Bumbag. Staying hydrated while riding is a must, and the advantage of a hydration pack is that you don’t have to stop your riding to have a drink. If you are going to transport your bike to where you are riding, then you will have to decide on which method best suits you. 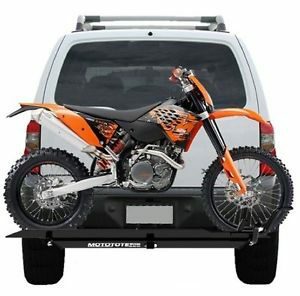 Whether it’s on the back of a ute or truck, in a van, on a trailer, or a towbar mounted bike rack, there are advantages and disadvantages to each. Air Filter Cleaning: Very important if you’ve been in dusty or sandy conditions. Chain and Sprockets: Keep it well lubed and check the adjustment before every ride. Check tire pressure: Usually 15 psi or less, depending on conditions. Battery charging: If you leave your bike standing for more than a few weeks, it’s a good idea to remove the battery and put it on a trickle charger overnight. Batteries don’t hold a charge well when left unused for long periods. If you’re not mechanically minded, and just do these things listed at a minimum, and then drop your bike in for a good service once a year, you’ll have it covered. A very useful thing to learn is how to change a tire. This is something that you can pick up in time as you become more confident. You never know when you will need it. As you become more experienced and confident doing maintenance on your bike, these tips in my post 50 Handy Tips will be useful to you. No matter how experienced you may be on road, it doesn’t help you much when you have to deal with very steep inclines, rocks, sand, ruts, water crossings etc. Don’t be afraid to let someone else help you get through a tricky trail. We’ve all been there, and you will get better. If you are riding with a club there will be a trail leader and sweep rider following on behind, so if you come unstuck, help will soon be there. 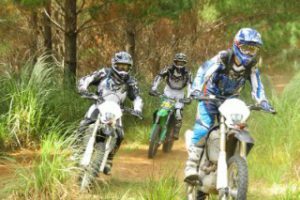 Trail riding is all about having fun with your mates. The friends you ride with will most likely become longterm riding buddies. It’s not about how fast you go, it’s about enjoying the bike, the places you can get to on the ‘road less traveled’ that even 4WDs can’t get to. So there’s are a few basics tips for the beginner dirt bike rider to get you started. Get out there and have some fun! Has this been helpful? If there is anything else you’d like to know, don’t hesitate to ask your questions below. I’m always happy to talk dirt bikes. I like dirt bike racing and i have a few friends that are really into it, now most of them having their own bikes, but they got into the dirt bike world without a clue..man did they need tips on how to ven ride one. After a lot of bruises and a few dislocated bones, I’m happy to say that they are more experienced and knowledgeable. I totally agree of not going cheap on the boots and helmet, i might not be the one on the bike but i have seen some tragic accident that could’ve been avoided with the proper equipment. I enjoyed reading your tips, it might not be too late for my buds to go over your info, i will pass it along. Hi Arlet. Thanks for your comments. Yes, boots and helmet would be the most important. What price do you put on your head? It’s always good to be steered in the right direction when getting into something new. 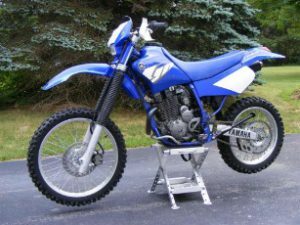 My next post is tips on buying a used bike ‘How To Buy A Used Dirt Bike – What To Look Out For’. Living in the country years ago and on a decent sized property, as a kid I remember riding a 125cc motorcycle and that was probably enough for me! My brothers had bikes and it was truly fun and a good part of my childhood. I also went out with a guy who used to race and do the big jumps. It was quite hard on his body but I must say it is a good spectator sport! Hi Sharon, yes it certainly is great fun. It’s good that you had a chance to ride when you were a kid. I started at about 14 and still love it in my 50’s. Thanks for dropping in.